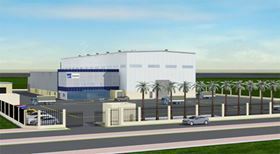 Ebara Pumps Saudi Arabia LLC’s planned new facility in Dammam, Saudi Arabia. Ebara Pumps Saudi Arabia LLC (EPS) will service and support customized pumps and manufacture and sell standard pumps. The Japanese company has sold pumps for many years in the Middle East, mainly for petrochemical and desalination plants. It has a strong track record in the region, shipping more than 5000 customized pumps to Saudi Arabia. Ebara is now looking to expand its service and support business throughout all stages of a product’s life cycle, including supplying parts and providing repair and maintenance services. This project has received support from Japan Cooperation Centre for the Middle East (JCCME) with financial assistance from Japan Oil, Gas and Metals National Corp (JOGMEC). Ebara Corp has opened a new workshop in Dammam, Saudi Arabia. Ebara Corp has officially opened its new pump workshop in Dammam, Saudi Arabia. Colfax Fluid Handling, Flowserve and Ebara.